CleanPowerSF is proud of our SuperGreen community of businesses and residents that has elected to go above and beyond to fight climate change and help San Francisco reach its climate goals. Thank you! Meet some of the businesses that run on 100% clean electricity below—a few are offering special discounts for SuperGreen residential customers—and don’t forget to visit our CleanPowerSF events page, too. If you’re not yet a SuperGreen customer and would like to join us, please get in touch! Allbirds is dedicated to making better things in a better way, using premium natural materials to create sustainable footwear. Amour Vert is a San Francisco-based sustainable fashion company that creates beautiful clothing with versatility in mind. Amour Vert pioneers entirely new fabrics that don't pollute, and their local supply chain and distribution channels have the lowest possible environmental impact. SuperGreen residential customers: Show your electricity bill at either the Marina or Hayes Valley store during April and receive 15% off a full-priced item! Lead by Danny Montoya, a credentialed early-childhood educator with more than a decade of experience in the classroom, The Butterfly Joint offers classes and camps that instill the importance of focus, problem-solving, resilience, determination and responsibility through the timeless art of woodworking. 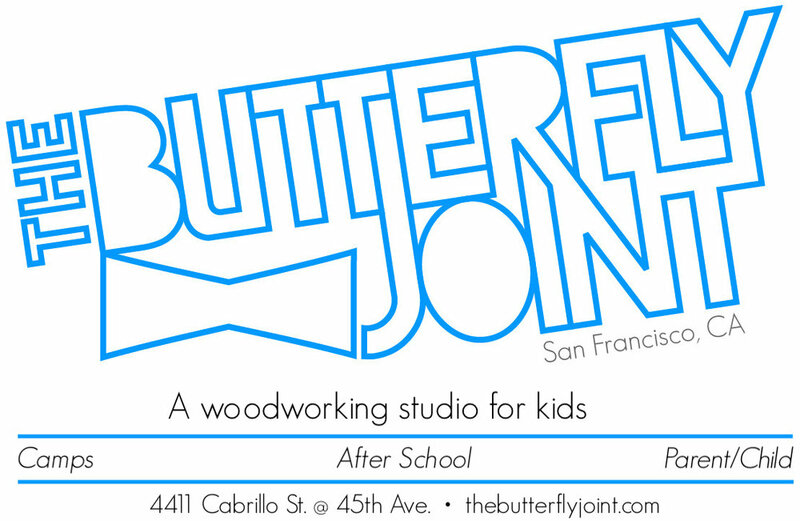 Along with woodworking skills, The Butterfly Joint focuses on teaching children manners and personal responsibility as well as helping parents reinforce productive social and emotional behaviors for their children. SuperGreen residential customers: Receive 10% off when you sign up for any Butterfly Joint camp or class during the month of April! Email make@thebutterflyjoint.com a picture of your electricity bill (where it mentions SuperGreen under the CleanPowerSF Generation Charges). You’ll receive a discount code to complete your purchase online. Founded in 1948, Heath Ceramics is a handcrafted ceramic tableware and architectural tile manufacturer and purveyor. Last Minute Gear is the only outdoor gear shop that lets you buy, rent, or borrow gear for camping, backpacking, snowsports, and climbing. SuperGreen residential customers: Get 15% off when you buy new items at the store (just bring a copy of your bill). Founded in 2015, Les Kidz is a French American preschool that offers a quality French language immersion education for children ages 1-5. Integral Yoga, as taught by Sri Swami Satchidananda, offers a synthesis of six branches of classical Yoga: Hatha, Raja, Japa, Karma, Bhakti, and Jnana Yoga. The Integral Yoga Institute offers daily classes in meditation and yoga for all ages and abilities, from kids yoga to advanced, as well as restorative and therapeutic yogas. SuperGreen residential customers: Show your electricity bill at Integral Yoga Institute during the month of April and get a free drop-in class! This offer is valid for the first 100 customers only. The New Wheel is an electric bike shop whose mission is to not only change how we get around, but to bring good things and fresh ideas into the lives of people in our community and California as a whole. They are committed to their customers through careful selection of technology, top-notch service and an unwavering optimism for the future of transportation and electric bikes in the Bay Area. SuperGreen residential customers: Receive the first year of a service membership for free when you purchase an electric bike at the Bernal Heights location on Cortland Ave. Remember to bring in your electricity bill for proof during your visit. Pinhole Coffee stimulates senses with coffee, art and community in San Francisco's Bernal Heights neighborhood. Rainbow Grocery is a worker-owned cooperative serving San Francisco and the Bay Area since 1975. The store features a range of organic vegetarian grocery items, bulk goods and supplements. True Laurel is a cocktail bar and restaurant that serves a la carte food and drinks in the Mission neighborhood. Enjoy a SuperGreen themed cocktail at True Laurel in April! In providing information about certain San Francisco businesses that are on SuperGreen service, CleanPowerSF does not intend to create any association, affiliation, joint venture, or partnership with the businesses and/or their programs for SuperGreen residential customers. Rather, the sole and limited purpose is to provide information for CleanPowerSF customers. CleanPowerSF does not control or endorse the programs or their providers or associated organizations or persons, and does not warrant the accuracy or reliability of information provided about the programs by their provider or associated organizations or persons.